Well, a small pebble of reality cracking, yet NOTHING is insignificant in this world of ours where toothpastes that actually damage your teeth are advertised by "beautiful" smiling models with false teeth. Enjoy! I didn't actually crack the shampoo scam, all I did was write this. But as with any other protected thing, at least somebody knows the truth all along. The truth here is that shampoo's bad for your hair. It cleans out dirt, but also the oil that makes your hair shiny and strong. However shampoo's sold as something your hair really needs, and the truth is suppressed. There are several common sorts of soapy things. They attract oils by electric charge, allowing the oil to be emulsified with the water. For some reason, these cleaners are themselves made from fats. Soap is made from animal or vegetable oil, and detergent is made from mineral oil. Detergents can be made more powerful. Shampoo is detergent, just like dishwashing detergent, bathroom cleaner, and engine block cleaner. People used to use soap to wash their hair, as well as their dishes, clothes and bathrooms (and horses, before there were engines.) Soap was better suited to washing hair, because it didn't remove so much of the oils that are naturally in hair. But the water supply slowly changed. It's now generally more alkaline, which people call hard water. When this started happening, soap didn't work so well. The chemicals which make water alkaline make soap stop lathering well, and form insoluble scum (eg. the ring in the bath.) So soap got less and less effective for all its cleaning uses. I guess the water was always pretty alkaline in some places, so soap was never an ideal cleaner. Around the beginning of the twentieth century, household detergents became available. Detergents have no problem with alkaline water, so they were really popular. They soon became cheaper than soap, too. So that's why people stopped using soap for almost everything, and started using detergents. Detergents are excellent cleaners for most uses. If you've tried using soap to wash your hair, you probably know how your hair goes all rough and tangly. This is worse if your water's harder (more alkaline.) I moved recently, and suddenly started having problems using soap in my hair. The problem is that hair reacts to acids and alkalis. Each hair has little scales, like scales on a snake or shingles on a roof. Acid makes the scales lie down flat, which makes your hair shiny and smooth. (Ever heard that lemon juice is good for your hair?) Alkali makes the scales stand up, which makes your hair look dull and feel rough and tangly. Therefore hard water, which is common these days, makes it harder to wash your hair. If you use soap to wash your hair in hard water, then the combination of your hair's scales standing up and the soap forming scum makes your hair into a terrible mess. Then, since your hair's all tangled and rough, it's impossible to rinse out all the soap, which makes it look terrible. Shampoo, being detergent, can rinse out of your hair fine even in alkaline water. That's its only good point. Its fundamental, but covered up, bad point is that it's very harsh, and damages your hair permanently. Conditioner was soon introduced as people noticed that shampoo sucked the oils out of their hair dry and left it all dry and brittle. Conditioner puts artificial oils in your hair, and they stay there just long enough so that you don't associate the damage to your hair with the shampoo that caused it. You have to wash your hair every day, not because it always gets dirty so fast but because the oils from the conditioner don't last and have to be replenished. Conditioner wasn't used until shampoo came about. Remember that your hair's dead. That exposes half of shampoo advertising as lies. Remember that shampoo is just detergent. That shows that most of the remaining half is lies too. Remember that the oils your hair needs come naturally out of your scalp, as they've been doing for thousands of years before conditioner was invented. When you think about it, nothing that is claimed about shampoo and conditioner is true. In a way, we really do need conditioner, as advertising implies. But the real reason why we need it is because our hair gets damaged by shampoo. This is just another case of using lies to help a bad product (shampoo) gain dominance over a good product (soap), then introducing another product (conditioner) to compensate for the bad product's faults, and then tricking people into accepting huge price increases once they forget the good product. The only good thing about shampoo is that it doesn't work any worse in hard water. Does that ever get mentioned in advertising? The rest is lies, to fool you into paying $10 for a $1 bottle of perfumed detergent. Soap is good to wash your hair with. Forget all the dregs of misinformation spread by shampoo manufacturers, and forget that soap is "harsh". Remember that the problem with using soap is in the water, not the soap. You just need to solve the problem of the hard water, and soap is fine to use. I can recommend two ways. If your water's not too hard, just substitute soap for shampoo, and use any old cheapish conditioner. The conditioner will make the scales on your hair lie down, and let the last of the soap get rinsed out. You might have to experiment with different soaps and conditioners. Maybe some conditioner which is pH balanced is best. Some "good ol" plain soap with no added water and perfume is probably best. Otherwise, you can add some weak acid at some point in the washing process. Since you need just a tiny amount, even cheap vinegar will do, without leaving a smell. You could make a soap goo out of soap and water, and add a bit of lemon juice. You could have a jug of water with a teaspoonful of vinegar in it, to rinse your hair with after soaping. Or how about pouring it into a plastic squirty bottle, so you don't spill it. Another good thing is oil of rosemary. 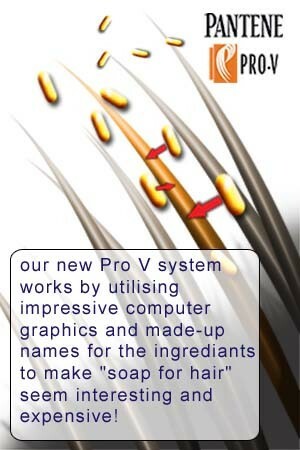 It stimulates your scalp, to encourage the natural oils to flow. Actually I haven't worked out how to get it onto my scalp, since there's all that hair in the way, but I've heard it's possible. So in summary, shampoo had a legitimate claim as an alternative for soap. But now it's not sold by that claim, it's sold by lies. Soap's better for your hair, and you can still use it if you compensate for hard water. For more great articles on reverse engineering reality, go to Fravia's SearchLores website.